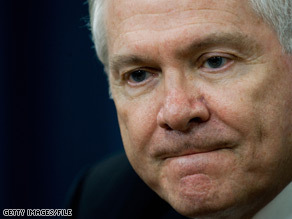 Defense Secretary Robert Gates Tuesday signed a memo establishing a military command aimed at cyber warfare and defense. WASHINGTON (CNN) - Defense Secretary Robert Gates Tuesday signed a memorandum establishing for the first time a military command aimed at conducting cyber warfare, and defending the military's computer network. The so-called Cyber Command - -also known as USCYBERCOM - is expected to be headquartered at Fort Meade, Maryland, and headed by the director of the National Security Agency, according to Pentagon officials. The new command will report to the U.S. Strategic Command, which has overall military responsibility for protecting military networks. "We're increasingly dependent on cyberspace, and there's a growing array of cyber threats," said said Lt. Col. Eric Butterbaugh, a Department of Defense spokesman. To counter the risk, the department "requires a command possessing the required technical capability and which remains focused on streamlining cyberspace operations," he added. The top members of the House Armed Services commended the move, and the recommendation that Lt. Gen. Keith Alexander, currently the director of the National Security Agency, lead the agency. "Cyber operations are a critical part of our national security and will only become more important in the years ahead. We commend Secretary Gates for establishing a Cyber Command under STRATCOM, which will focus on these issues in a joint and coordinated way," said House Armed Services Chairman Ike Skelton, D-Missouri, and Rep. Adam Smith, D-Washington State, who chairs a subcommittee on terrorism and unconventional threats. The Pentagon has acknowledged in the past that it is the target of thousands of attempts daily by entities looking for ways to gain access to the Department of Defense computer system. A recent Pentagon report to Congress about China's military power said China has been making continued progress in developing cyber warfare techniques. The report noted that U.S. government computers were the target of "intrusions that appear to have originated" from China, although they were not confirmed to be from the Chinese military. but can cyber command really do anything? Great placement location as there is a large think tank community. Prioritizing efforts to address the top threats of malware, botnets, and a new laser focus on infrastructure protection by the energy and transportation communities will make this succesful.